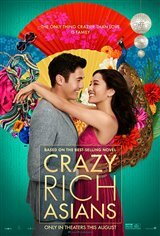 Rachel Chu (Constance Wu), an American-born Chinese economics professor who lives in New York, has been dating her boyfriend Nick Young (Henry Golding) for over a year when he invites her on a trip to his home country of Singapore to attend his friend Colin's wedding and meet his family. On the trip, when they're booked into first class on the plane, Rachel soon finds out Nick comes from a very wealthy family. In fact, he's one of the most sought-after unmarried men back home — and probably throughout the rest of Asia. When Rachel meets Nick's mother, Eleanor (Michelle Yeoh), it quickly becomes clear that the woman thinks Rachel isn't good enough for her son and never will be. Even though Nick is crazy about Rachel and is considering marrying her, Eleanor does everything she can to come between them. Knowing that his family is very important to Nick, Rachel feels she either has to stand up to Eleanor — or let Nick go.